I bought this broken, with the imfamous chip problem.There were also some other problems, like a slider stem broken off, and sliders not working or missing caps. But these are all things I think will be relatively simple to fix, and plus gives me a reason to order an extra D80017 chip for my MKS-30. Even though one of the notes sticks on (voice 2 I think) there is no doubt why this was such a popular analogue. The sounds are excellent and simple to manipulate, this will be a new novelty for me as none of my other keyboards were editable this way. I can hardly wait till I get the stuff to fix this!! Dec 2008: Tried to get sliders from Roland, they no longer have them in stock, sigh, I guess I'll have to get them through eBay. May 10 2010: Ordered sliders,caps and other parts from Technology Transplant (Honk Kong) and they finally arrived (2 months later). Just soldered in the new parts and now this baby looks and (almost) sounds like new. My new chips should be in in a few weeks. 2012: The remaining 3 original chips have died. 2014: I have now replaced all the chips with D80017 clones! 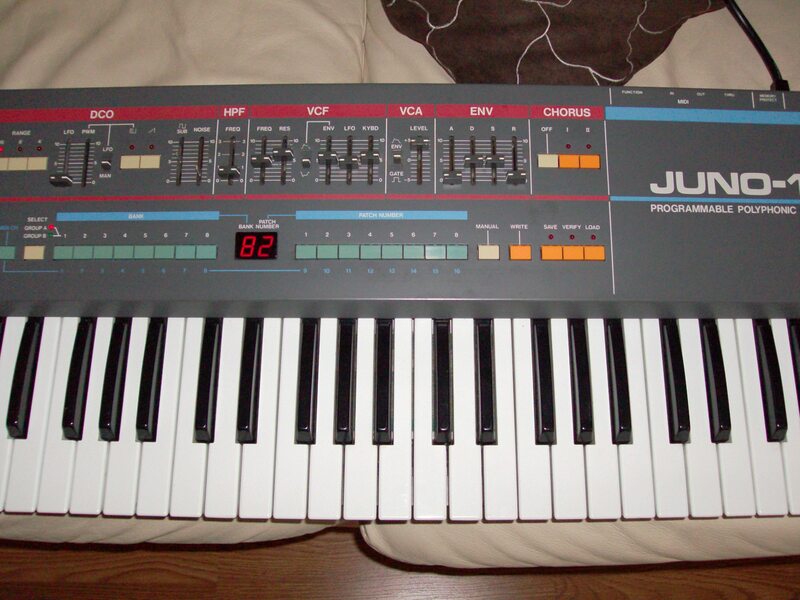 I finally have my Juno-106 back!! I just have to do some adjusting as some of the voices are a bit different. electronically voices need a bit of adjustment. 2017: Starting to use it more and more. 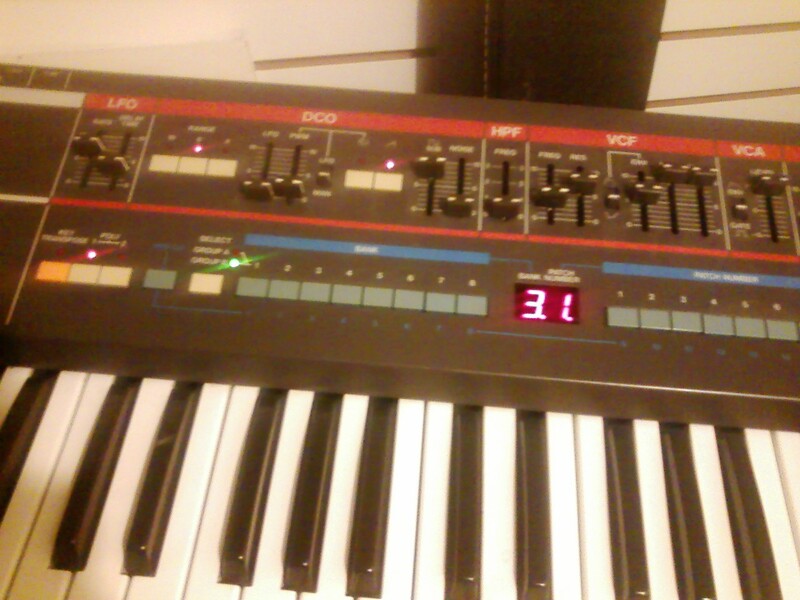 I have it set up as a mono solo instrument, it's too bad it couldn't be programmed in and out of mono mode. Or memorize it's MIDI channel. 2016: Sitting on the bottom tier of the 3 tier stand, but not getting the use I thought it would. 2014: Replaced the last 4 chips with clones, so everything works now, just needs a bit of adjusting. 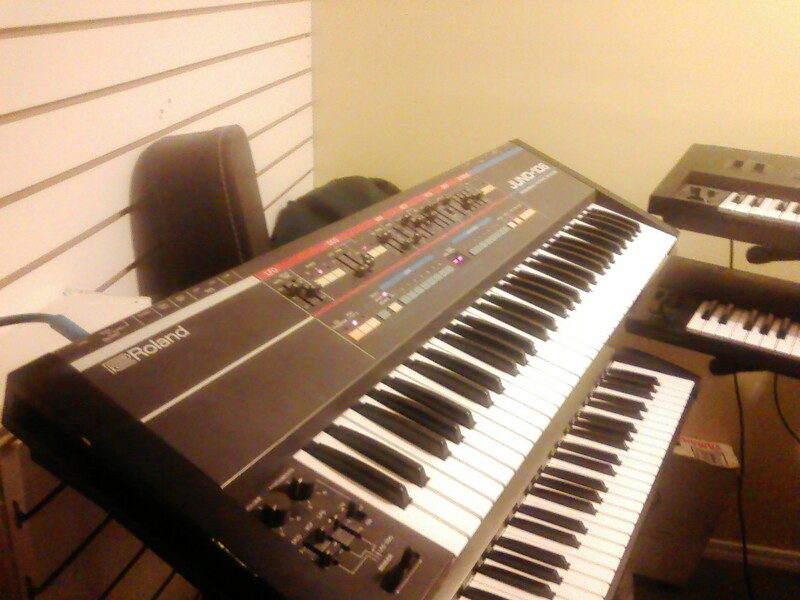 Set up with the other keyboards now. 2012: it is set up downstairs but only 3 chips still work. 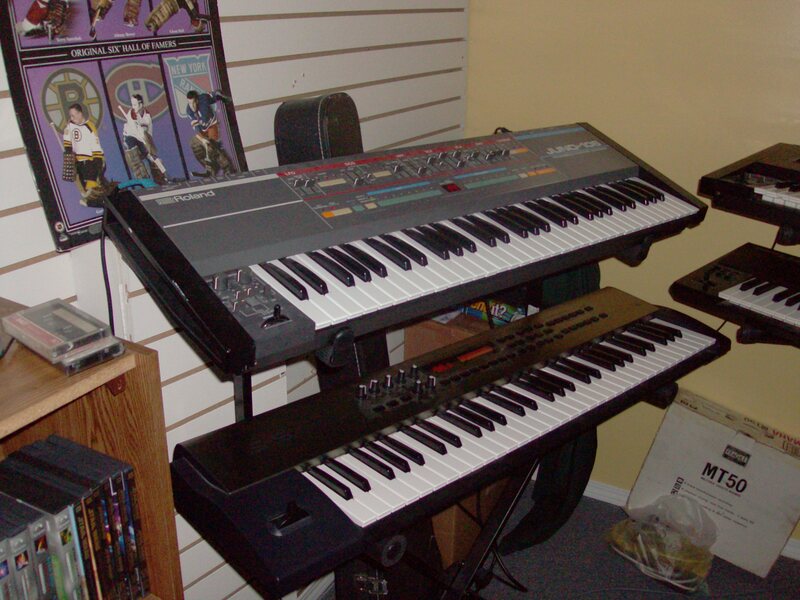 2010: It is set up downstairs with the other keyboards, although it has some voice chip issues. I have just ordered some new D80017 chips, sliders and other parts. I should be able to fix it soon. Dec 2008:I at the moment have it set up in my dining room! I am gearing up for a live Beker show, and am practicing as much as possible. Although it's not incorperated in the show I just like having it set up.